The fullness of Vivian Reiss’ life is reflected in the vibrancy of her paintings. Her work is large scale, luminously colorful, and endowed with a vibrant sense of joie-de-vivre. The vitality of her life is channelled in her vivid portraits, still-lifes, and landscapes. Reiss’ work is a passionate exploration of form and color, thriving off the interplay and tension between both. Her large scale oil-on-canvas works, developed over a 35 year career, reflect deep aesthetic concerns, as well as a sophistication in the expression of the joyous and the beautiful. Her compositions brim with movement, thriving off the tension between a sense of perspective and flatness; and multiple compositional concepts thematically replayed in numerous guises throughout the canvas. Her works concentrate not on technique but on expression. Form and perspective are expressed by color which is both intense and employed with a intensively detailed eye towards hue and the mixing of multiple shades. The impression is of movement expressed on the static surface of the canvas, as compositional dialogues within the paintings are always in flux. Reiss’ work has been put in context with Alice Neel, Florine Stettheimer, Daivd Hockney and Matisse and she lists influences as varied as Pop Art, Dutch & Flemish paintings from the Renaissance, Expressionism, The Spanish School and Persian miniatures as her influences. Reiss also has the energy of the abstract expressionists, reflecting the influences of her New York youth. Reiss was born in New York in 1952 to Hungarian immigrants. At the age of nine she visited the Prado Museum in Madrid. As closing time approached, her reluctance to leave became a declaration to become an artist. Reiss went on to pursue fine art studies at The School of the Museum of Fine Art in Boston and The Art Institute in Boston. Her work gained the support of Marilyn Powers and Jason Berger and she continued her apprenticeship under their guidance at The Direct Vision Atelier in Brookline, Massachusetts. Reiss currently lives and works in Toronto, Canada and spends time regularly in New York City. Reiss has traveled widely, and her wanderlust is an important element in her work. She has lived in yurts with nomadic herders in the mountains of Kyrgyzstan, painted elephants in Africa, and studied dance in Bali. Reiss’ background in numerous art forms, from dance to sculpture to the culinary arts suffuses her art with multiple visions of artistry, including the art of living which she paints with wide strokes. Her collection of ethno-cultural artifacts, ranging from miniature kitchens to Central Asian silk caftans, are reflected in her work and showcased in her larger-than-life home. In addition to the Triennial, Reiss had a concurrent show at The Canadian Embassy in Tokyo of Reiss’ portraits of prominent Canadians in the arts. Her portraits are known for their intimacy between subject, artist and art. A catalogue of Reiss’’ portraits has been published, including a wide range of subjects – portraits of friends, acquaintances, as well as portrait commissions. Reiss’ work is known for its vibrancy and the intriguing interplay between her sense of joy and her deep understanding of elemental aesthetic concerns, played out with psychological depth and passion for the creation of the sublime. 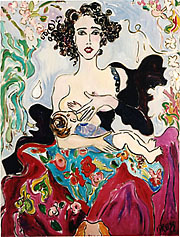 Reiss’ series of Kewpie dolls exemplifies the artists long term interest in still-lives, which provide a platform for understanding the complexity of her compositional ideas. Each of her Kewpie Series works embody a separate compositional concept, reflecting the way that color and form interact in a constantly changing myriad of relationships within the painting. Reiss has completed several series of work, including the Henhouse Series, monumental garden triptychs, and a series of paintings of snow monkeys from Japan. The V Reiss Gallery in downtown Toronto was founded as a multifaceted exhibition space for Reiss artistic projects and collaborations. A unique inspirational space, the V. Reiss Gallery was designed by Reiss herself. It is meant to be a personal showcase for her work, and therefore is a unique encompassing aesthetic experience. It is one of the only opportunities in Canada to view a body of work in an environment designed by the artist themselves, offering an intimate viewpoint and environment for understanding one artist’s vision of the world and of art. Reiss’ design for the gallery is intriguing. The exterior of the building is clad in carved wooden monkeys, and on the West end of the façade Reiss has superimposed an enormous, 20 foot stained Plexiglas palette along with an oversized wooden paint brush onto the exterior of the building, creating an undulating window on the inside of the gallery. The interior is equally remarkable, covered in cut ceramic plates with tiled portals flanked by curved walls, curved baseboards, and curved moldings – an architectural work of art where everything seems to be folding in on itself; molding into Reiss’ own sense of geometry; and flowing into her artwork in both abstract and figurative ways. Reiss’ talents go beyond the canvas. She has designed numerous architectural projects (over 60 projects in Toronto), created integrated multimedia performance events, created installations, has facilitated numerous social events and salons, and designed costumes, clothing, gardens, and furniture; and is currently working on a cook book. I love your work and joie de vivre! Your paintings are refreshing and lively! Love that you have drawn inspiration from such eclectic, and worldly influences! Also, your blog is so intersting and candid…and I can’t wait to try your scrumptuous recipes!